There are two roles of language – disclosive and representative – and it seems to me that in the worlds of design and innovation only the representative role of language is utilised, normally unconsciously as those involved in design and innovation mostly do not have a background in hermeneutics, the study of meaning. 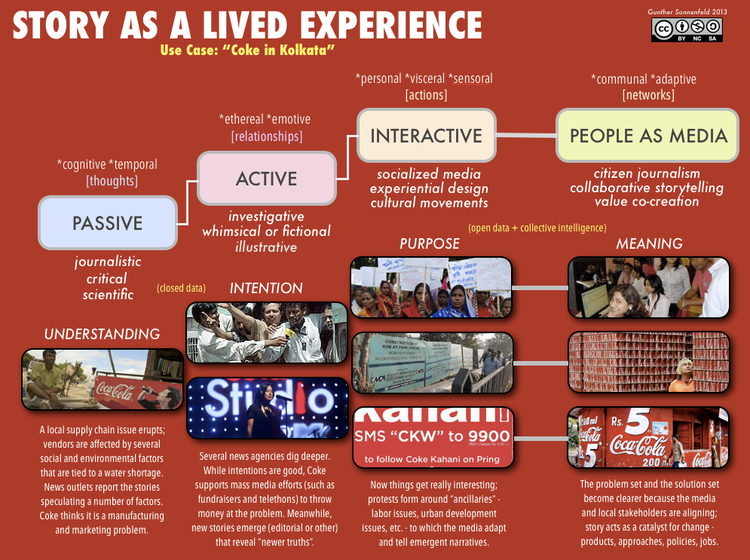 In this post I wish to offer a short reflection, that hopefully will inspire some thoughts about branding, user interface design, and the phenomena of transmedia experiences. We are used to hearing discussions about the representative role of language, where a word represents an object of some sort, and in the news this week there have been two really interesting developments designed to enhance automatic translation. Microsoft announced developments which have improved the use of computers as live translators, and Google announced their breakthrough technology for the translation of sign language into spoken language, both excellent and worthwhile projects. We walked down to the well-house, attracted by the fragrance of the honeysuckle with which it was covered. Someone was drawing water and my teacher placed my hand under the spout. As the cool stream gushed over one hand she spelled into the other the word ‘water’, first slowly then rapidly. I stood still, my whole attention fixed upon the motion of her fingers. Suddenly I felt a misty consciousness as of something forgotten – a thrill of returning thought; and somehow the mystery of language was revealed to me. I knew then that ‘w-a-t-e-r’ meant the wonderful something that flowed over my hand. That living word awakened my soul, gave it light, joy, set it free! … I left the well house eager to learn. Everything had a name, and each name gave birth to a new thought. As we returned to the house each object that I touched seemed to quiver with life. That was because I saw everything with the strange new light that had come to me. 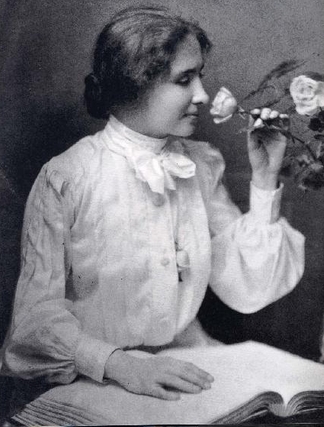 For Hellen Keller, water had not yet “appeared” to her. We sometimes think that objects in the world appear to us, and then we give these objects a name. This is our experience of learning a foreign language, when the world has already appeared, and we need to find the word in a foreign language for what we already know. But here we discover, in this example, the disclosive aspect of language, where it plays a dynamic role in revealing the world to us. This is the opposite way around to the way in which we normally think of language, objects and meaning. Understanding language is like walking along a tightrope. We can so easily lose our balance and fall off on one side or the other. On one side we fall into the fallacy of believing that words simply express thoughts which are already formed – in which case language would be no more than the clothing of thought, merely its ‘casing’ or the ‘wrappings’ in which it is packed. On the other side we fall into the fallacy of believing that the words produce the thought, as if it were merely the words. One way we underestimate language; the other way we overestimate it. Either way, we miss language. We need to think in a way that does not separate into two but at the same time doesn’t collapse into one. If we can walk along this tightrope without losing our balance, we discover how words and meaning are intimately linked in the act of saying in such a way that words neither create meaning, nor merely reflect meaning that is already formed. We see the meaning through the words that say it: ‘Language has the capacity to point to something that is not a product of language, but which is nevertheless always grasped by linguistic means’. This is remarkable, because it flatly contradicts our common sense assumption that words are just tools, merely conventional signs, for representing what we have already understood. This quote is an amazing one to finish with, since in it Bortoft offers the advice that “We need to think in a way that does not separate into two but at the same time doesn’t collapse into one.” It is very common to hear people state that we need to move away from ‘either/ or’ thinking to ‘and’ in order to develop our mental capacities and levels of consciousness. People discus this relating to leadership and mental models, as well in design thinking and innovation. But often those who discuss this notion have already fallen off the tightrope. There are also very clear implications for those in marketing, and in relation to the development of brands. It is why I like the work of my friend Gunther Sonnenfeld, who in the previous guest article writes about the way in which companies are beginning to lose ownership of the meaning of their brands. There are huge implications for those in marketing who want to explore the path towards sustainable brands and joint meaning. When do take time to explore hermeneutics, and allow the deep teachings to reveal themselves to us, so that we can walk the tightrope, we will have a seriously profound notion of how the world is revealed to us, a notion that allows us to understand that others experience different worlds, worlds which are not though separate, but are different aspects of a single whole. It takes time to get this point, time, dedication and the desire to be open to radically new ways of understanding the world. But this is what makes great designers, innovators and leaders. They take appearance seriously. In my own field of programming there is a LOT of talk about languages, though they are more symbolic than metaphoric, but there is a stumbling towards the idea of a bigger picture, e.g. Domain Specific Languages (DSLs), but there is still this either/or thinking. It remains to be seen if the ‘and’ thinking can be embraced in the technical area or not. In terms of thinking non-dualistically, I have a hunch that we may not be able to do it very often, especially if you take on Iain McGilchrist’s ideas about brain hemisphere characterisations. It may be that the balance is a dynamic one. Living things move after all, so a balanced being is never statically so. Would you say that only in this latter phase of generating knowledge can we consider we are thinking non-dualistically? Hmmm. More thought and experience required. I do not have answers to all your questions, but one thing I have been looking at is the notion of the semantic web and the various ways to mark up a page for example, using authorship. This is totally in the representative mode and fails to acknowledge the disclosive mode of language. As for the experience of wholeness, I really feel I have to consciously move into it but for everyday living I am still very much in the subject – object world.